Felt great to feel good today–just a bit tired first thing but that wore off, so we went to church with face masks on both of us just to keep our friends on the safe side. I was afraid H’s mom had already flown home, but no, there she was. Turns out that although she mostly quilts and crochets, she knits, too, and she was gobsmacked that I had made her this softness and that her daughter and I had plotted together on the color. She instantly put it on and proudly wore it the rest of church, even though it was thick Mecha and it was 76 out. I looked and looked for the woman who’d exclaimed over my half-done yellow cashmere I’d started for her last month and finally resigned myself to taking it home yet again and hoping for the next time. We were maybe three steps from the entryway by the door to leave when the hall door opened and she was backing up against it almost into me with her arms full. Turns out she taught one of the primary classes. THERE you are! I’ve been looking for you! I pulled her cowl out of my purse, stuffed into a small ziploc. She said it again, marveling, and gave me the hug that was really most of all for Someone looking out for her up there in those moments who knew more and deserved it more than I ever could. Her favorite color was supposed to have been sold out before I ever even saw it listed. One cone suddenly became available at the moment I signed in to Colourmart that day. It’s hers now. So now I understand why I couldn’t find her earlier. Oh! I almost forgot–there was a middle-aged woman I didn’t recognize with small children whom I did, and before church started she was trying to calm the toddler down. He was okay while they were in motion but not once she sat him and his baby brother down. Routine was Mommy and Daddy here once a week and this was someone else and not how you do it and he was Not Having It. I mah MAHMAH! I was back in the aisle just as 92-year-old Jean was coming up from behind with her walker. I guffawed. I didn’t even know she’d seen any of that. I dug down in the purse for whichever Peruvian hand knit treasure should come up. “A honeybee! For your garden!” Jean’s garden is the great passion of her creativity. I think she really was hoping for one of those bright parrots, though. 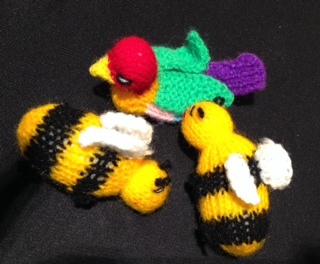 Looking at these other two bees just now, I find the stitches were pulled shut at the bottom–oops! Not a finger puppet! That’s a first–clearly she needs a do-over. I also need to make that other grandma a cowl, quick. Washable looks definitely the way to go.